What’s the most effective thing, by far, you as a parent do to prevent your kids from smoking, drinking alcohol, using drugs – a tactic that’s completely in your control? Don’t smoke, drink alcohol, or use drugs yourself. 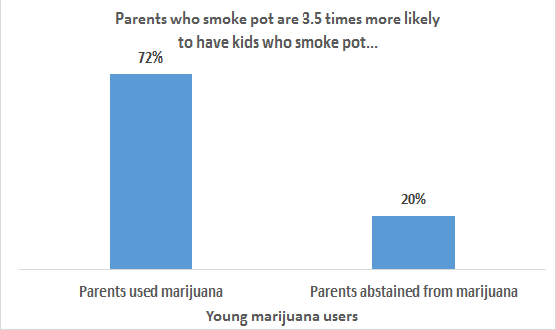 Repeated studies of kids of parents who indulge addictive and mood-altering substances, including marijuana, are two to four times more likely to do likewise (see figure). “Parental use of marijuana has been found to be a significant influence on teens’ use of this drug,” summarized the text Drugs and Society (p. 414) . Simple, right? Every other society on earth seems to get the fact that teenagers tend to act like the adults around them – but not the United States. Now, in Colorado and Washington, which have legalized marijuana for adults, campaigns urge parents to “talk (with) your teens” about marijuana.” Not to act responsibly themselves, or abstain to set a good example and avoid exposing youths to greater dangers. One imagines a Cheech and Chong scene where the grownup, roach clip around neck and smoke emanating from nose, piously orates to the kid about the dangers of weed. What baloney. First, if this argument was sincerely held, it would justify parental abstinence from marijuana even more strongly. Eliminating youths’ pro-smoking adult models and protecting “developing brains” from damage from breathing adults’ secondhand marijuana smoke would be seen imperative. Second, there’s no “science” involved. Brains develop throughout life, losing memory and learning genes and cognitive capacity in the 30s years and beyond – all of which can be exacerbated by heavy alcohol and drug use. If the pot-damages-developing-brains argument is valid, it applies to aging adults, not just teens. The best, most recent long-term study of 400 teen boys and their parents over 30 years found that even early, regular use of marijuana by teenagers did not lead to later psychosis, anxiety, depression, or health problems. Third, the studies that claim teens who smoke pot have higher rates of depression, poor school performance, etc., uniformly fail to account for past histories of abuse, parents’ addiction, etc., and focus on heavy marijuana users. It’s true that frequent marijuana smoking tends to be concentrated in families and is correlated with higher rates of mental problems, other serious health problems, and birth defects among adults as well (although the literature betrays a singular lack of enthusiasm for studying adults). Marijuana is clearly less dangerous than alcohol, criminalization of marijuana use is harmful to young and old alike, and legalizing it makes sense. But the genuinely responsible campaign would be to lay off the teen-panic, to discourage heavy marijuana use by all ages, and to have strict standards for marijuana use and driving and pot smoking in homes where children are present. But such a responsible approach – which would require genuine caring about young people – is no fun for the reckless adultists who exploit fearsome images of teenagers either to criminalize or to legalize marijuana.